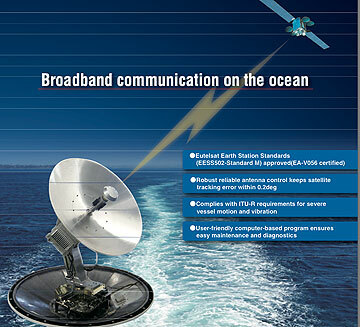 A new maritime broadband satellite communications product developed by Mitsubishi Electric Corporation has been awarded Type Approvals following extensive testing conducted by the Global VSAT Forum (GVF), the non-profit association of the satellite communications industry. The Type Approvals were provided through the GVF Product Quality Assurance Framework, which was established by the international satellite industry to improve earth station technology design and performance. Mitsubishi Electric’s Type Approvals award represents a major achievement because the technology demonstrated its ability to consistently provide high-quality Ku-band transmissions via a 1.2-meter Very Small Aperture Terminal (VSAT) designed for use onboard maritime vessels (the model name is the MVA120 series). The tests were based on the Eutelsat and Intelsat satellite-operator specifications, which are among the most rigorous in the world. As part of the GVF Product Quality Assurance Framework, the association provided outsourced Earth station type-approvals testing services for Mitsubishi Electric through a mutually-recognized test framework and an industry-authorised network of testing entities. Major global and regional satellite operators rely upon the service, which is provided by GVF, through its Mutual Recognition Arrangement Working Group (MRA-WG). “Three units of the same antenna model were tested and they operated in conformity with specifications for Eutelsat and Intelsat,” said Fulvio Fresia, who is Co-Chair of the GVF MRA-WG and who served as the GVF authorised test entity who witnessed the tests in Japan. The procedures used are similar to the time-tested and well-understood procedures employed by the major satellite system operators over the past two decades. Successful completion of the process results in a type approval issued by one or more satellite system operators from whom type approval is being sought. In this regard the process is transparent to the antenna manufacturer or system integrator seeking type approval for their product. The GVF Mutual Recognition Arrangement (MRA) maintains procedure GVF-101, which defines a set of standard tests that an antenna or earth station manufacturer must perform in order to apply for type approval from any satellite operator who is a member of GVF. Use of this procedure assures the quality of the ground communication equipment and provides the Earth station operator with a complete set of measured and verified test data. This helps reduce the time and cost required to bring new ground-segment technology to the market, provides credible measured performance data for use in developing link budgets, thereby advancing the competitiveness of satellite communications services. A key aspect of the procedure is the approval by the GVF membership of "Test Entities." Authorized Test Entities (ATE's) are those individuals or organizations that the members believe are competent, impartial, and experienced enough to certify that test data taken by a manufacturer may be used with confidence by any satellite operator member, without requiring any re-testing. Under the GVF-101 procedure and GVF Board decisions, only those members of the GVF who are satellite operators may vote on approving Test Entities, and the vote must be unanimous. Parties interested in participating in the GVF-101, the GVF Mutual Recognition Arrangement Procedure for Type Approvals, may download the document from. For additional information about the MRA Working Group, please contact David.Hartshorn@gvf.org or Colin.Robinson@gvf.org.